“Welcome to Del Dotto Vineyards, where Wine is Liquid Art and Our Cave is the Art Gallery. When we drink from a new barrel, it is like looking at a painting, cutting it up, and eating it! We experience the art; it becomes part of our life experience. The value of the remaining pieces goes up because there is less for the world to enjoy. The homepage of the Del Dotto winery (www.deldottovineyards.com) opens with the above quote from Mr. Del Dotto. Del Dotto has two wineries open to the public. 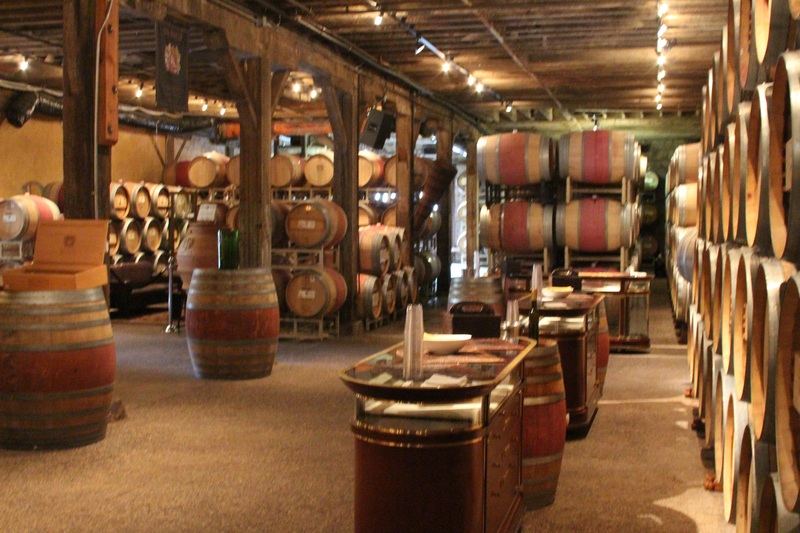 The newest is the Del Dotto Venetian Estate Winery and Caves in St. Helena. 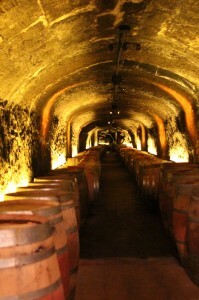 We elected to visit the Del Dotto Historic Winery and Caves that include 350 feet of historic caves. 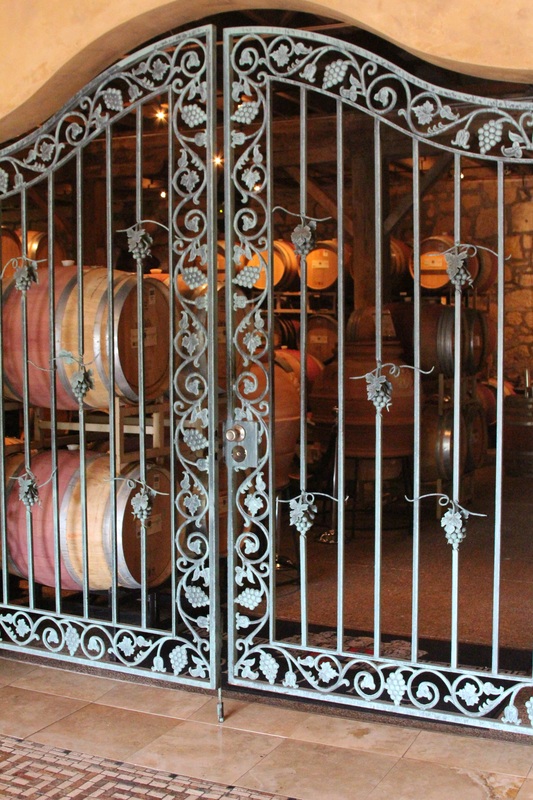 Walking through the front doors of his winery is similarly cloying and a bit of an eye-roller. While undeniably beautiful, the front of the house is a bit over the top. 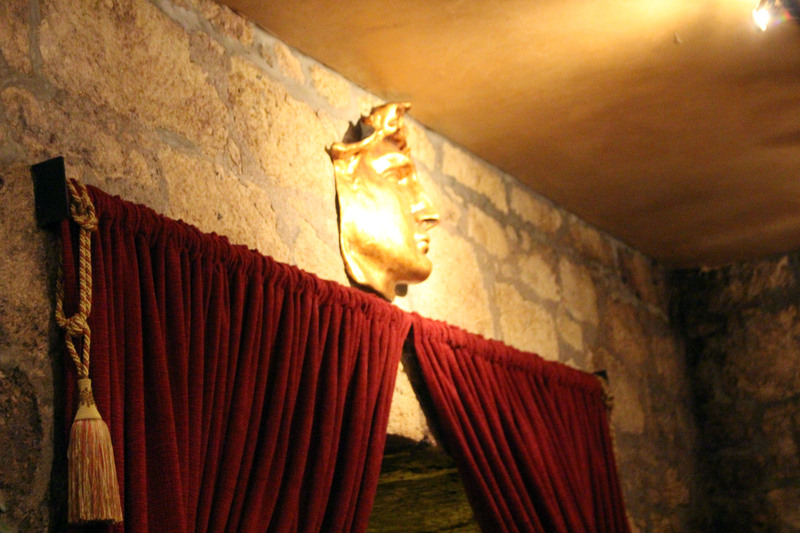 There even appears to be a bust of Caligula in the corner (though I could be wrong about that, my eye for Roman emperor busts is not the greatest). All of that vanishes when you walk through the iron gates that separate the front of the house from the cave area. The tour and cave area is all tastefully decorated (except for the disco ball. Seriously). There are barrels everywhere, accentuated with art, and smattered with educational information about the wines and barrels. We had decided to take the Del Dotto Cave Experience & Barrel Tasting ($60.00 per person) because of the rave reviews it has gotten from tasters everywhere. I had never done a tasting right out of the barrel and it sounded like a lot of fun. I was not prepared for the uniqueness of the experience, nor the generous pours of each wine thieved right from the barrel by our guide. We met our tour guide Michael, a tall brown haired man with glasses who appeared to be in his early thirties. Michael has gone to school for winemaking and spent time as an assistant winemaker before moving to Del Dotto. He was the perfect guide, knowledgeable, passionate, and personable. He was never stumped, and he never failed to entertain. 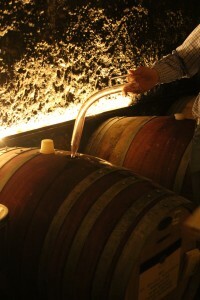 The first barrel we tasted from had Pinot from a La Tache clone that came straight from Romanee Conti, but I digress. I don’t intend to review the Del Dotto wines. They are all very good, though more than a bit pricy. Suffice it to say, the wine makers at Del Dotto do very good work. 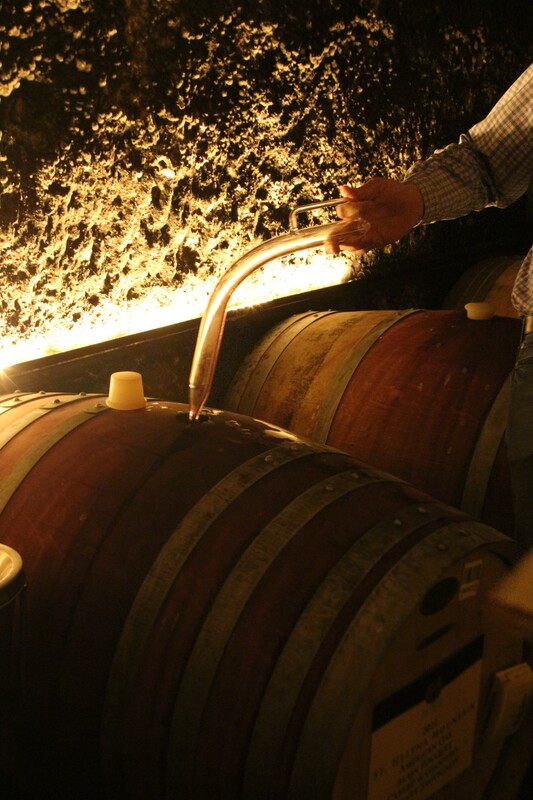 The point of going to the Del Dotto barrel tasting is not the wines, it is the borderline obsessive care they take with their oak barrels and the flavors and nuance they impart to those wines. As we walked from the display stand into the perfect wine storing temperature of the cave, the first thing that strikes you is how rough the walls and sloping roof is. This is because the caves were hand dug by Chinese laborers back in 1885. The pick marks from their digging are still evident and have never been smoothed over. The lighting in the cave is adequate, but very subdued. It is just enough to see by and makes for some beautiful pictures. As we stopped at each selected barrel, our guide would describe the wine, the vineyard it came from, and the barrel construction. We learned about the nine oak forests in France, the American oak, and even Hungarian oak. 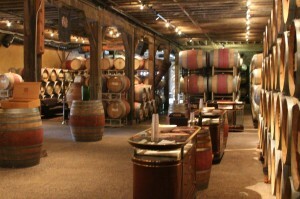 Near the middle of the tasting, we stopped at two barrels of exceptional wine. They were identical Cabernet Sauvignons from their Oakville vineyard. Each was poured at the same time into side by side barrels. One of French oak, the other American. The difference between the two wines was very noticeable. They had the same fruit, but with very different backbones. To amplify the experience further, we moved from those two barrels to a barrel with alternating staves of French oak and American oak. Del Dotto has them custom made and as far as I know, they are the only ones to have a half French half American barrel. The result was not quite a blend of the two, but something else entirely. The last of the barrel craziness on the tour was a barrel made of alternating staves from each of the nine French forests. I was not a fan of the wine, but you have to admire the dedication to trying new things with oak. As we left that barrel and started to head back, our guide asked if we would like to try a Zinfandel on our way out of the cave. Well…. normally we wouldn’t, but we didn’t want to be rude. So I suppose just this once. Or twice….Ok so I may have tried to set up camp by that barrel. I’m only human. After the cave portion of the tour, we returned to the outer area of the cave rooms for a bottle tasting of Zinfandel, Port, and a clay pot aged Zinfandel accompanied by cheese, chocolate, and charcuterie. I need to take a moment to thank our guide Michael once again. I don’t know how many barrels we are supposed to taste from, but once he detected our excitement and genuine interest, I am sure he went way above and beyond. The entire experience was amazing. It was everything they promised and thanks to our guide, even more. I give this my highest recommendation and would go back in a heartbeat. We had two people in our group that did not come with us. It was a couple from Ohio celebrating their birthdays with a trip through wine country. 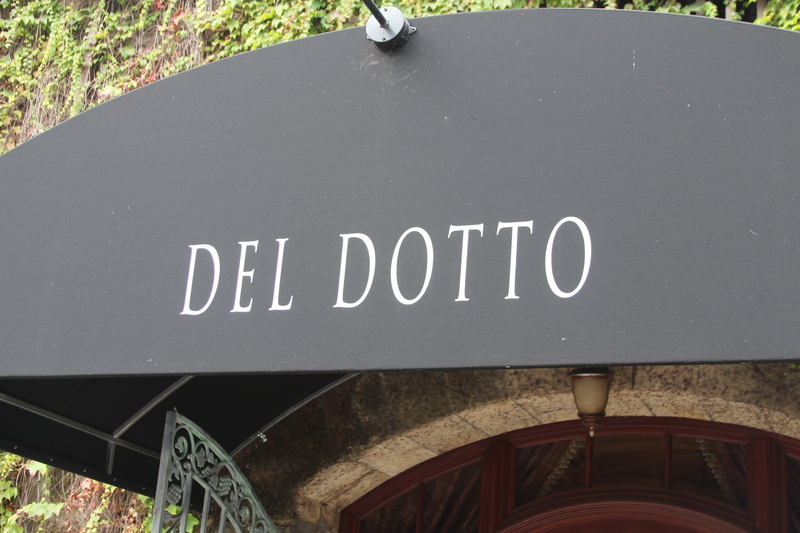 Del Dotto was not only their first stop in Napa, it was their first winery tour period. I think they will be disappointed with their next stop. It is sure to pale in comparison.